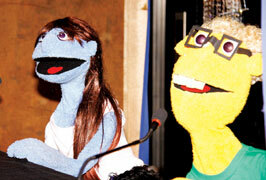 Nexus Networks(Pvt) Ltd introduced two puppet characters, Nexy and Skoose as the new 'faces' of Nexus. Nexy will act as 'Customer Devotions Manager' and will ensure that an efficient customer service is provided. The other puppet character, Skoose will act as the 'Super Duper Offers Manager' and is responsible for all merchant relations. These characters will be used to liven a campaign launched by Nexus. Roshinie Jayasundara Moraes, Sector Head, Retail and Executive Vice President of JKH Group emphasised how Nexus hopes to add value to its cardholders. Keells Super's promotion with Nexus offers a 20 percent discount on 100 everyday products to all Nexus Blue cardholders till October 31, adding value to Nexus cardholders.